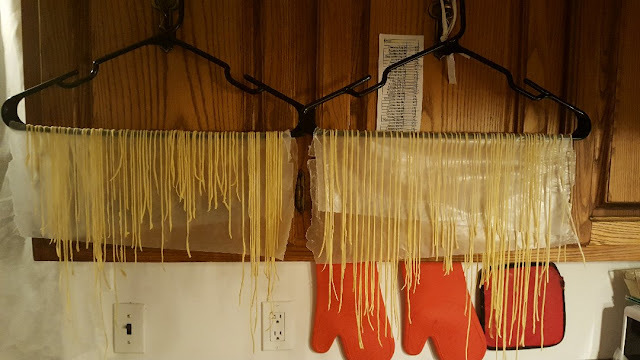 After yet another store bought, cardboard-tasting pasta experience a few weeks back, we decided NO MORE! 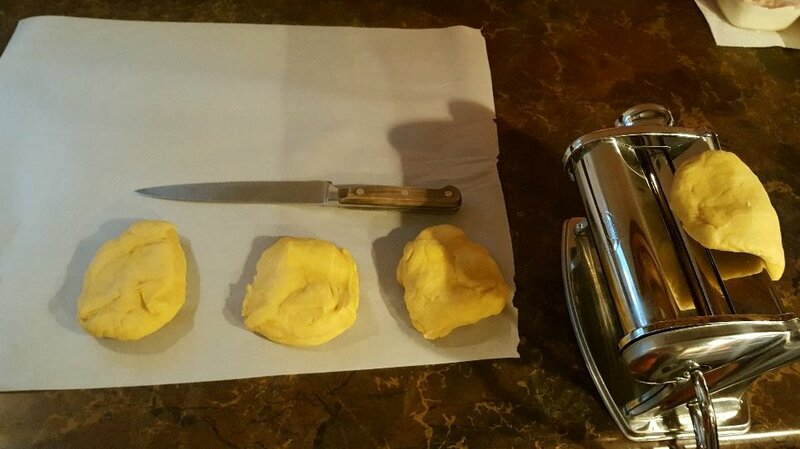 From now on, I'll be making my own pasta at home. As I said in the title, it IS a labour of love. It's a long process but I found it really enjoyable! 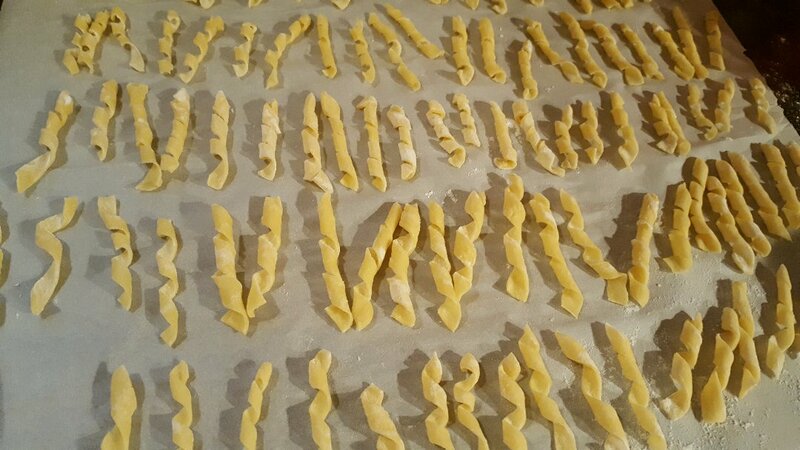 My idea was that I wanted to make fusilli pasta for our dinner, so that's what I started off with. Making your own pasta is inexpensive and easy. 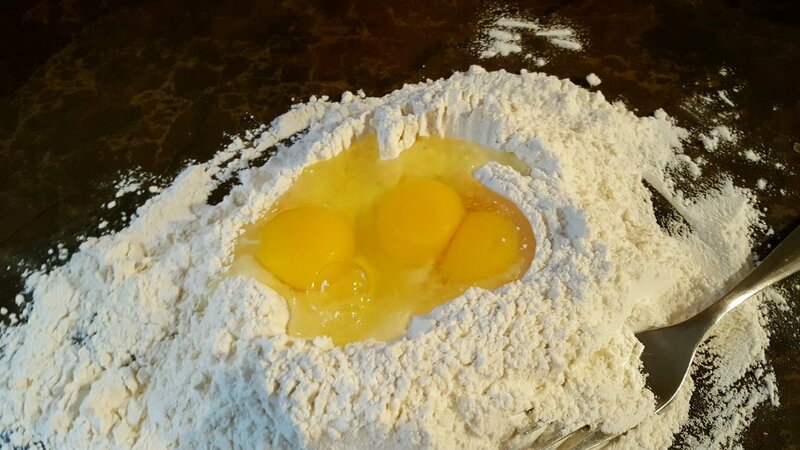 It's eggs, flour, salt and a wee bit of olive oil. I posted my recipe: Homemade Pasta. 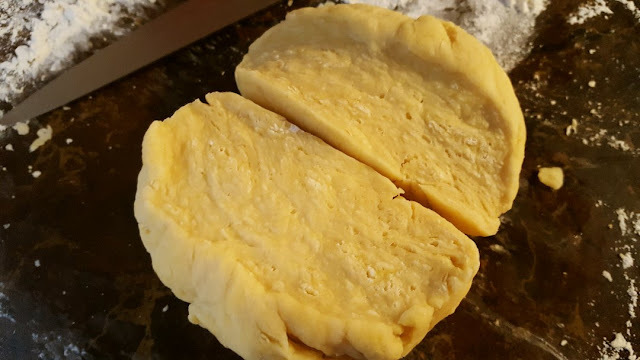 I found many recipes call for way too much flour, so I kind of made up my own and it worked very well! Then it needs more kneading. 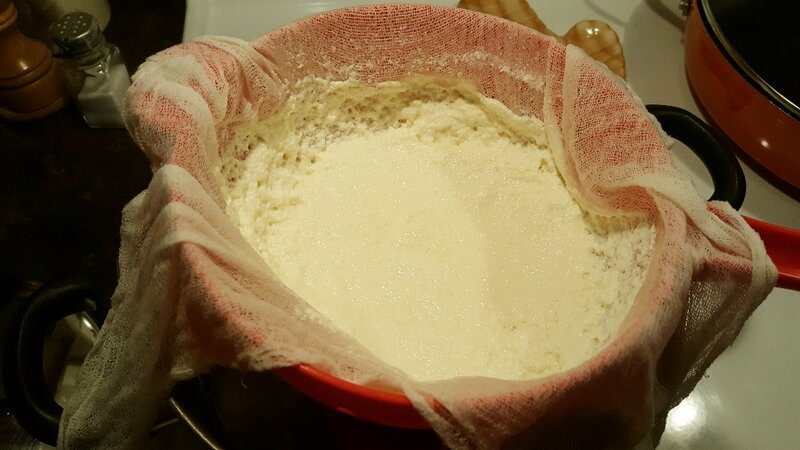 Of course, I had to make my own Ricotta. :) What's a homemade dinner without homemade cheese? This is a wonderful tool! My pasta maker. I love it. I bought this eons ago and it still works very well. It has an attachment on top for linguine and cappellini as well. After the rest period, I cut the pasta dough in four and started to stretch it out with the pasta maker. We like our pasta thin so I stretch it out a good 2 feet per dough ball. Here's how I made the fusilli. Once you get going it feels like an assembly line! A fourth of the pasta made enough for our dinner. I had lots of dough left so I decided to make ravioli also for the freezer. 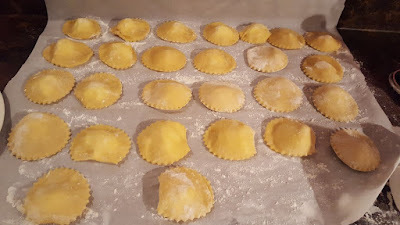 My Ricotta made 2 cups, dinner called for 1 cup, so I made ricotta ravioli. Homemade pasta is very filling, so this amount will make us two dinners. I used up two more balls of dough for this. With the last ball of dough, I made cappellini. This dried pretty fast on the hangers! You are only supposed to keep fresh dried pasta for a few weeks in an air-tight container. Makes you wonder what they put into the boxed pastas to keep them going for months and years huh? We only got dinner on the table around 10pm! That's usually my bedtime lol...It was very good! Fusilli with Ricotta and Ham Sauce. Next time I'll use more chives though, they kind of got lost in the sauce! Good thing we had dessert ready beforehand! 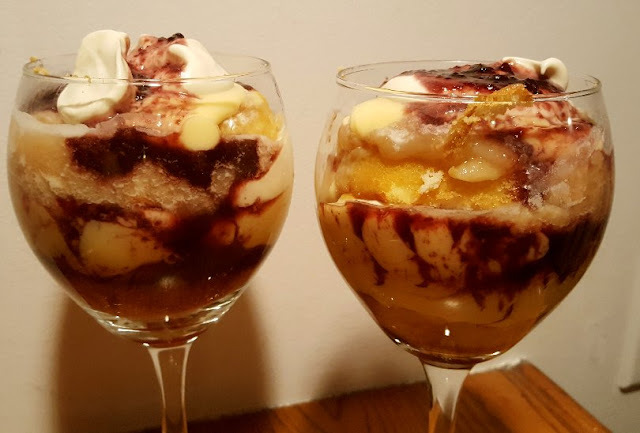 I made individual Trifles. This time though instead of raspberry jam we decided to open up one of our preserved cherry pit with rum concoctions and it was really nice! Aaah...the canines taking over our bed. Aren't they lazy-looking?? Believe it or not, Alex and I can still squeeze in there and have Oscar the cat on one of our laps too, though it's a tight squeeze!! 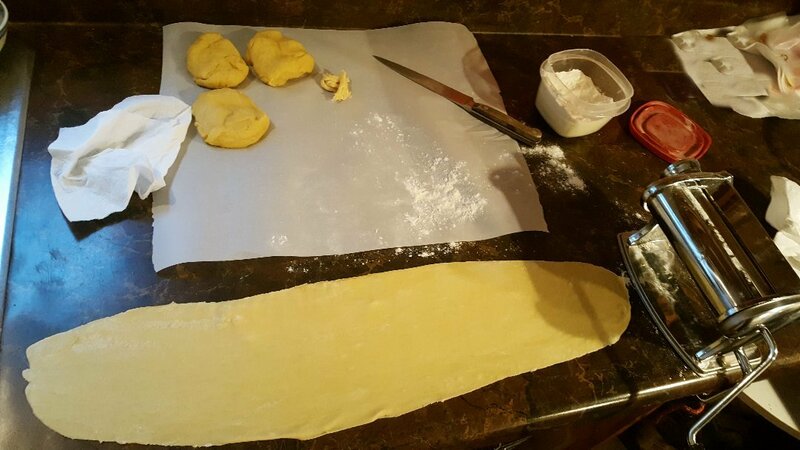 I have only ever made homemade pasta once. Its an incredibly time consuming feat isn't it!! I agree that homemade is much better! Just look at all the visitors on your bed!! :) They look like they are having grand time. Very cozy! It's very nice of the dogs to let you sleep with them on the bed! Rain! You're amazing! Now I am wondering what is in store bought pasta...ick! 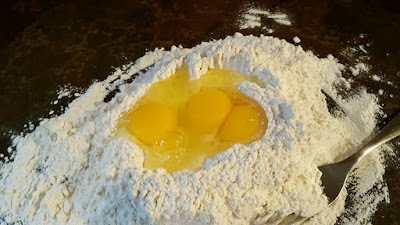 I think I might try making my own pasta. Cheese is too much commitment for me but pasta I think I could handle!! 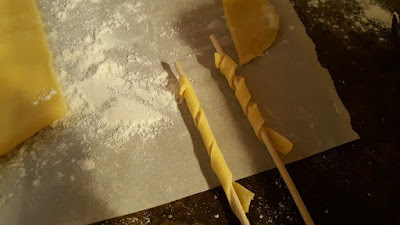 I am just about to the point of making my own gluten free pasta. It is so expensive in the stores! Now that I know it is an all day project, I will save it for a Sunday when hubby is watching football and I am bored. I have been eyeing the pasta attachment for my kitchen aid mixer. If my pasta turns out good, it may justify the expense. The Trifle looks yummy. I think I need to find some desert recipes that are semi good for us. Do you think there is such a thing? I posted my taquito recipe on my blog update for today. You ask and I deliver! At least you two are in no danger of freezing! I see that smart Jack is UNDER the covers. I used to make my own pasta and it was so much better - but you are right. It is a labor of love. I haven't mustered up the nerve to try rice flour pasta. Something tells me it will be as frustrating as gluten free pastry. I'm going the alternative route - cabbage lasagna! 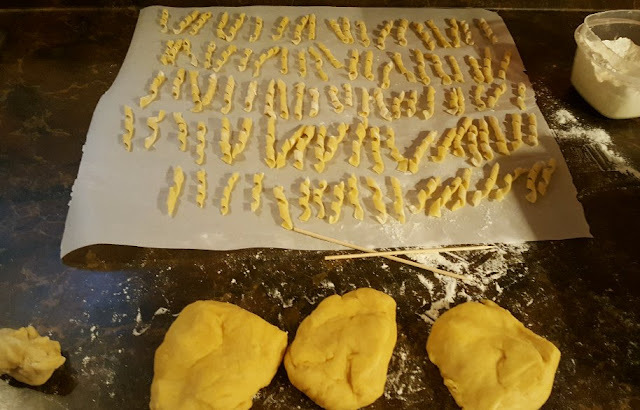 Wow that is so neat, I have never made pasta. We had a tiny bit of frost this morning, time to dig the sweet potatoes. Yes, you ARE the epitome of a full-time homemaker. And all the credit in the world to you for it. 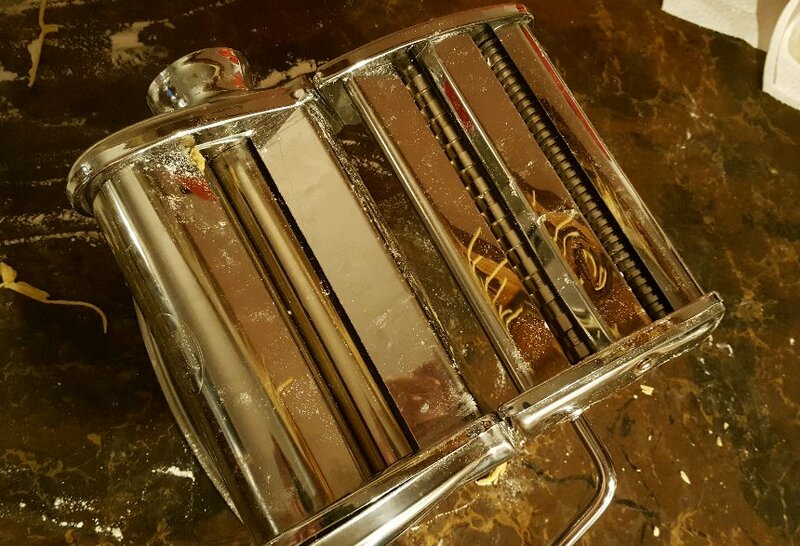 I used to make my own pasta but never had a pasta machine). A couple of years ago I bought what seems to be a nice one second hand from a couple that was downsizing. Haven't used it yet (shamey-shamey), but now you've encouraged me to get back at it this winter. My husband is not a pasta fan (says it's too starch-y) but I know he'll be more accepting of it if I make our own. 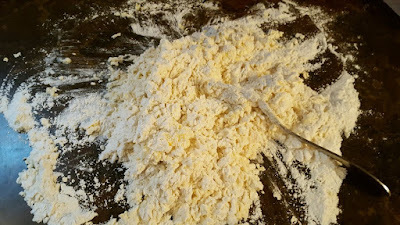 I'm gonna try using einkorn flour as I just read another article today describing how wheat is regularly sprayed with a poison 5 days before harvest (!) to make the harvesting easier. No wonder so many people have wheat allergies these days! Looks like a lot of work but with big rewards! Everything always looks so yummy at your place! You are right about wondering what they put in those store bought pastas to make them last that long. I'm glad you are having fun with the whole process. 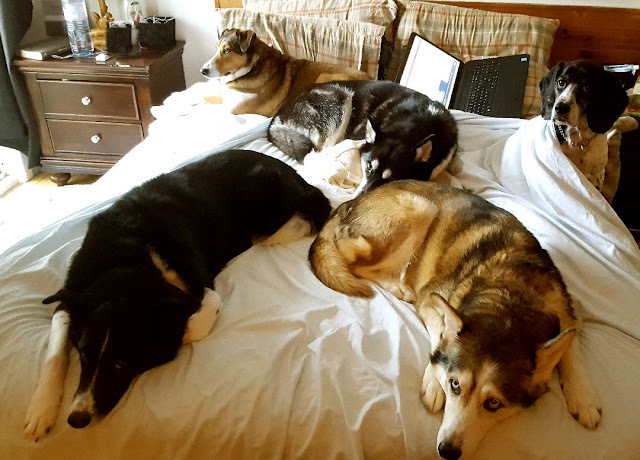 I just love the image of the dogs on the bed. So cute! you are amazing as is your pasta! You are one amazing woman! Now I know what I'll be doing this winter! LOL! Not sure I can eat it up fast enough but you can freeze it right? What a great job you did and thanks, as always, for the tips and the recipes. I have a Kitchen Aide that I use for kneading as the RA has stopped me from kneading a lot but I don't have a pasta machine...I'll have to look into that. It may have to be saved for as I think they are pricey? But I'm sure not everyone has one so there may be the old rolling pin? You are my inspiration! Love the dog's photo and there's Jack....under the covers as usual! LOL! They are so cute! Oh, ravioli too....yummm and look at the trifle! I cannot read your blog when I am hungry! Holey bagels you've got mad pasta skillz! I want to learn by your side. Hi Jenn :) Thank you! 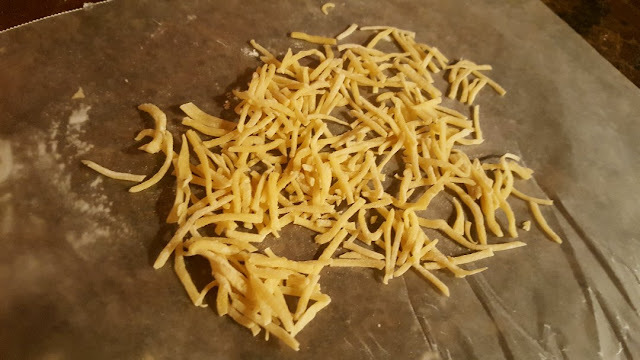 Every time I make my own food from scratch, I always taste the shredded paper they add to processed foods lol...pasta is an afternoon project, but you definitely reap the benefits! Hi Marsha :) I remember I didn't eat gluten for a year, trying to cure my digestive woes, and I also remember how much money I spent, it was crazy. I do it all by hand, but I would love to have an electronic gadget that makes the pasta and kneads the dough for you. 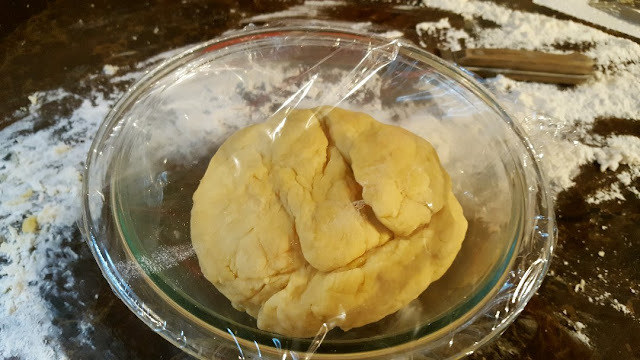 There are so many possibilities for shapes too and I'm sure your homemade gluten-free will taste better than store bought. Hi Susan :) Lol...Jack is very smart, under the covers immediately before the big dogs can take his spot! Rice pasta...using rice flour I'm guessing? I hope you can figure it out, homemade is so much better. Oh I like the idea of cabbage lasagna. You can also get "spaghetti" squash and use that for pasta dishes. I do that when they're in season! 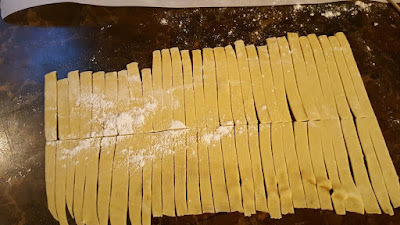 Hi Gill :) I think if you start making pasta, you won't want to buy the store bought ones ever again. And you don't need a pasta maker either, a lot of people make it all by hand, but it's much more work. Lucky you! Sweet potatoes is another crop I need for the future! Hi Martha :)) The more I make my own stuff, the more I want to make! But it seems like so much work some days. We got an email from that guy, he definitely won't be back before the summer so at least I can get myself into some kind of new routine with all the pets, knowing it'll be more long term now. 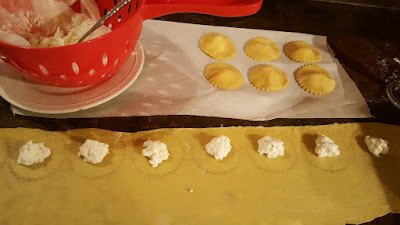 It would be nice to have allocate each day to something, like a pasta day, a cheese making day, a preserving day, a baking day, a hobby day...and then my day of rest lol! Haha...u need to buy a king size doggy bed ;) so precious. Nothing storebought can replace it !!! I know Nik...we definitely need a King sized bed for our next place. I even considered putting two Queens together!! 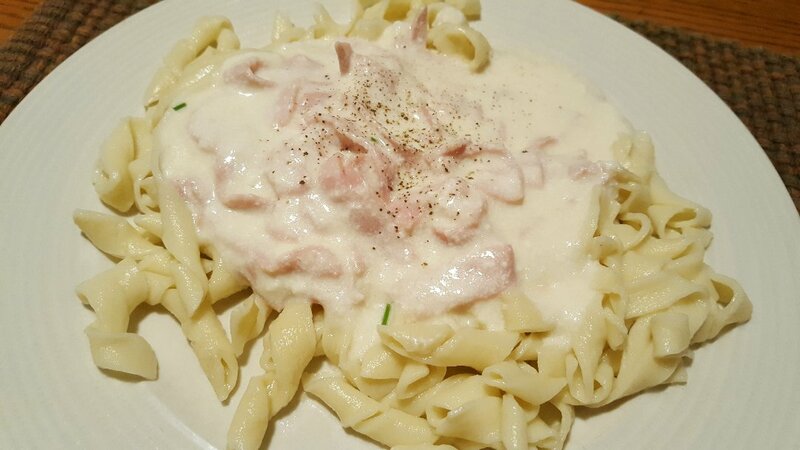 The pasta is really nice, we had some more last night. There is no comparison at all to store bought!